Widespread throughout Brunei. Elsewhere in Sabah, Sarawak and Kalimantan. Endemic to Borneo. Solitary slender to moderate rattan climbing to 10 m tall; stem without sheaths to 15 mm diam., with sheaths to 25 mm, internodes c. 10 cm long. 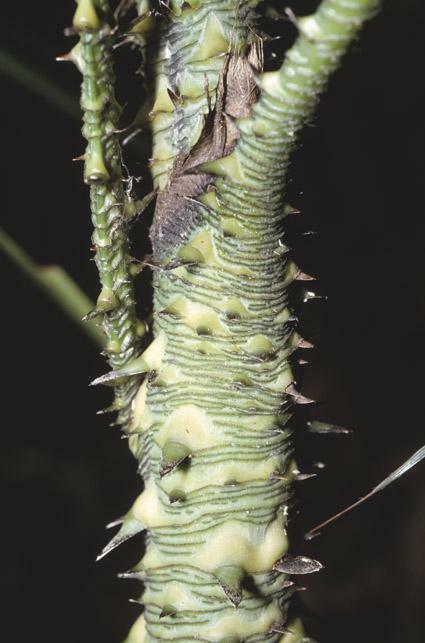 Sheaths bright green, very densely armed with close wavy circular ridges bearing minute tooth-like prickles and an abundance of broad triangular spines varying from 1-10 mm long, the sheath drying dull brown with a reddish cast; knee conspicuous, armed as the sheath; ocrea inconspicuous, rarely exceeding 5 mm. 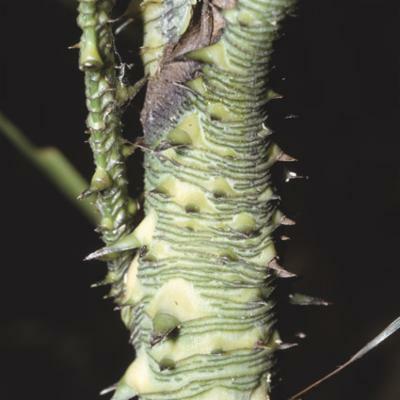 Flagellum to 3 m. Leaf ecirrate, curving, to 1.1 m including the well developed petiole to 40 cm, armed with triangular spines and ridges near the base; leaflets up to c. 30 on each side of the rachis, regularly arranged, generally curving, to 35 × 2 cm, dark green, armed with rather conspicuous bristles on the 3 main veins on both upper and lower surface and along margins, leaflets drying dull brownish with a reddish cast. Inflorescences to 3 m, with c. 4 partial inflorescences; primary bracts slightly to densely armed as the leaf sheath but with a few flat papery spines at the tip; partial inflorescences generally congested in appearance, rarely exceeding c. 20 cm, with many crowded rachillae; male rachilla to 2 cm, the female to 10 cm; rachilla bracts minutely ridged. Mature fruit rounded, c. 9 mm diam., with a short beak to 1 × 0.8 mm and covered in c. 14 vertical rows of pale brown scales. Seed rounded, c. 5 mm diam. ; endosperm deeply ruminate. Seedling leaf not known. (Fig. 64, Pl. 11A).